In the morning of Offroad Day 3, the rally left the beautiful ski resort of Straja and headed back towards Sibiu. With clear skies and world class tracks ahead of them, competitors were sent off in good spirits. Had they known what was awaiting them “out there…” spirits might have been slightly dampened. And despite the favourable weather, the track was still soaked and provided little grip. Halfway through the morning, competitors arrived in an area, that track director Teo Isac called the “Loop of Insanity”. This loop contains the sections “Galindo ridge”, “Babysitter” and “Long walk”. 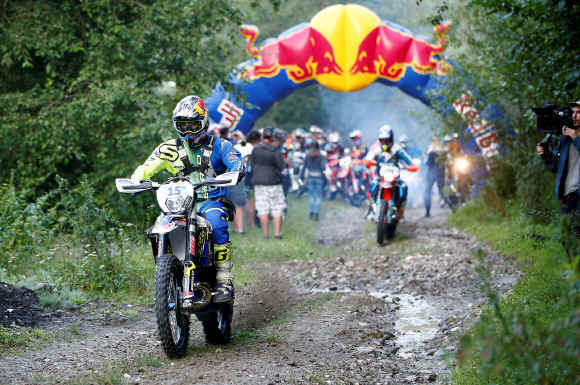 These are some of the toughest challenges the Epic Edition 15 of the Red Bull Romaniacs has to offer. It was going to separate the wolves from the sheep. The area became the perfect playground for the “Wolf pack”, consisting of Wade Young, Manuel Lettenbichler and Jonny Walker. Today was a step towards finding the world's best Extreme Enduro rider and to score valuable WESS points. Wade Young started the day on fire and kept pushing hard - trying to establish his lead position early in the day. Manuel Lettenbichler and Jonny Walker were chasing him into the “Loop of Insanity”, battling it out, neither one wanting Young to get away from them. Young however flew through the sections and made lots of time. The next best performer in this loop, Manuel Lettenbichler, lost ca. 10 mins on Young. Walker, riding with Billy Bolt hot on his heels, lost ca. 20 min on Young. Although Lettenbichler lost some time, he continued to chase like a bat out of hell through the tough sections, which didn’t appear to have any effect on his energy resources and he continued to gain time on the leader. However, all of them arrived completely shattered in the Service Point, which was situated in the middle of this “battlefield” - and were barely able to speak. After the Service Point, some well appreciated help was at hand: lots of spectators had made it out into Romanian wilderness to watch the world-elite in action. Noticing the suffering “out there…”, they started offering bananas, food and water at the sections “Galindo ridge” and “Long walk”. A welcome offering for Alfredo Gomez, who had raced without drinking water for a long time today. For him, it was the hardest day and the most technical one. Billy Bolt had stepped up his game this morning and joined the “Wolf pack” for the ride. He rode together with Manuel Lettenbichler for a while, until he got stuck on an uphill. Wade Young finished the day first, with Manuel Lettenbichler just seconds behind him (2nd). Jonny Walker (3rd) arrived 17 mins after Young, followed by Alfredo Gomez (4th) and Billy Bolt (5th). Out with the old, in with the new: Are we currently witnessing a new generation of extreme enduro riders surfacing? The “Wolf pack” have dominated the first three days and have not shown any signs of tiring, as they should be. In contrast, this years Epic Edition 15 has really taken its toll on some of our known veterans. There were two surprises at the start of the day: Taddy Blazusiak wasn’t able to start, despite his good day yesterday, due to sickness. Graham Jarvis, also had to pull out early in the day due to dehydration and exhaustion. Both hope to be at the start again for Offroad Day 4. Mario Roman, despite having hurt his hand during the prologue, kept pushing bravely through the pain. He finished the day as 6th. In the Silver class Dieter Rudolf maintain his lead over Michael Walkner and Josu Artola. Stefan Simpson was 5th,Dave "never again" Wood 10th, Josef Westgarth 15th, Grant Churchward 26th, Sam Ludgate 43rd, Keith Maude 61st, Richard Baxter 68th, Mark Kirby 69th, Steve Roper 78th, James Jackson 91st, Mark Jackson 92nd, Wil Westgarth 93rd, Jon Kingston 101st and Keiran Hankin.